Actual tiger in Detroit auto plant: Abandoned factory site of ridiculous stunt. 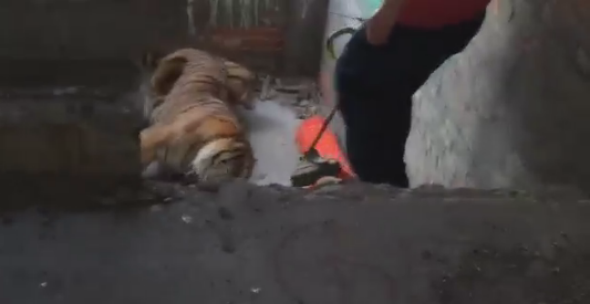 From a video of efforts to recapture the tiger. British photographer David Yarrow booked a two-day photo shoot at Detroit’s Packard Plant. Only problem was, he apparently didn’t tell anyone that he was bringing a tiger, two wolves and a bobcat with him … The animals, trainers and photographers were given the boot about an hour later. But not before the tiger got loose and holed itself up on a fourth-story staircase. The tiger was re-caged without any reported injuries to humans or animals.